Shefflin: named at wing-forward for Sunday's opener in Cusack Park. KILKENNY HAVE NAMED a half-forward line with a combined 16 All-Ireland medals and 13 All-Stars for their Division 1A opener against Clare this Sunday. Henry Shefflin, Colin Fennelly and Eoin Larkin will start in Cusack Park as Brian Cody continues to blend his squad’s experienced faces with some newer ones. Lester Ryan, Cillian Buckley and Walter Walsh will all make their first starts of the season against the reigning All-Ireland champions. Throw-in at Cusack Park is at 2pm. 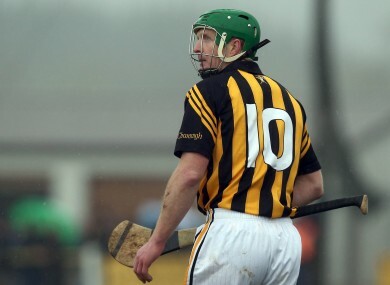 KILKENNY (SH v Clare): David Herity (Dunnamaggin); Conor Fogarty (Erins Own), Michael Walsh (Young Irelands), Brian Kennedy (St Lactains); Joey Holden (Ballyhale), Lester Ryan (Clara), Paul Murphy (Danesfort); Cillian Buckley (Dicksboro), Padraig Walsh (Tullaroan); Henry Shefflin (Ballyhale Shamrocks), Colin Fennelly (Ballyhale Shamrocks), Eoin Larkin (James Stephens); Jonjo Farrell (Thomastown), Mark Kelly (O’Loughlin Gaels), Walter Walsh (Tullogher Rosbercon). Substitutes: Eoin Murphy (Glenmore), Jackie Tyrrell (James Stephens), Tommy Walsh (Tullaroan), Willie Phelan (Dunnamaggin), Shane Prendergast (Clara), David Langton (Clara), Padraig Phelan (Emeralds), Aidan Fogarty (Emeralds), Liam Ryan (Clara), Joe Brennan (St Patricks), Thomas Breen (St Martins). Email “Shefflin, Fennelly, Larkin: Kilkenny name star-studded half-forward line for Clare league opener”. Feedback on “Shefflin, Fennelly, Larkin: Kilkenny name star-studded half-forward line for Clare league opener”.